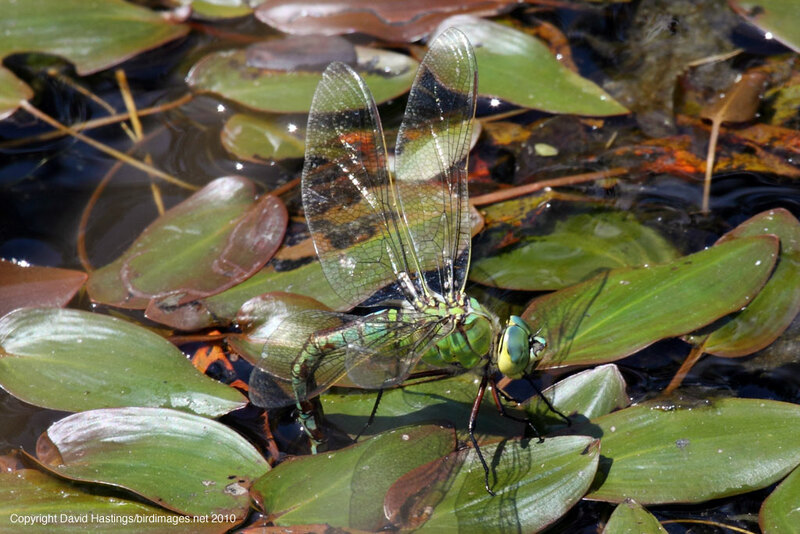 Emperor Dragonfly (Anax imperator). Male. Taken at Otmoor, Oxon., on July 4th 2015. Approx 2x lifesize. Male. Taken at Otmoor, Oxon., on July 4th 2015. 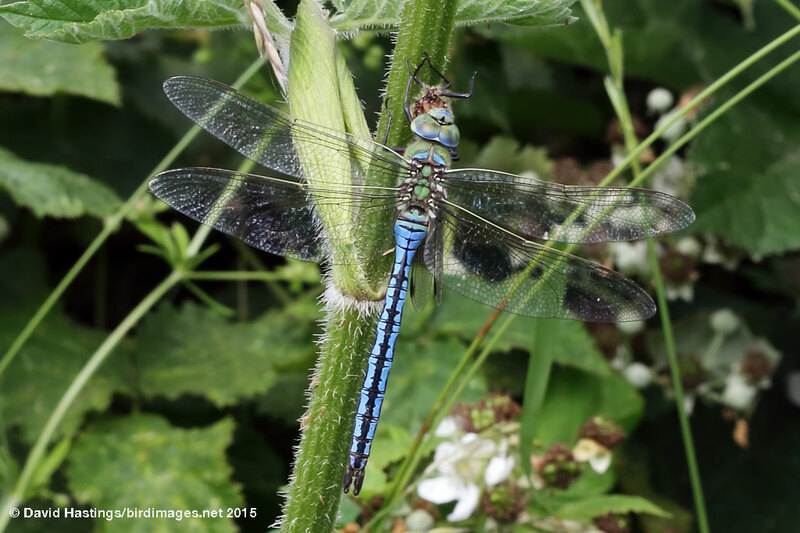 Emperor Dragonfly (Anax imperator). Teneral male. Taken at Bucknell Wood, Northants, on May 27th 2017. Approx 2x lifesize. Teneral male. Taken at Bucknell Wood, Northants, on May 27th 2017. 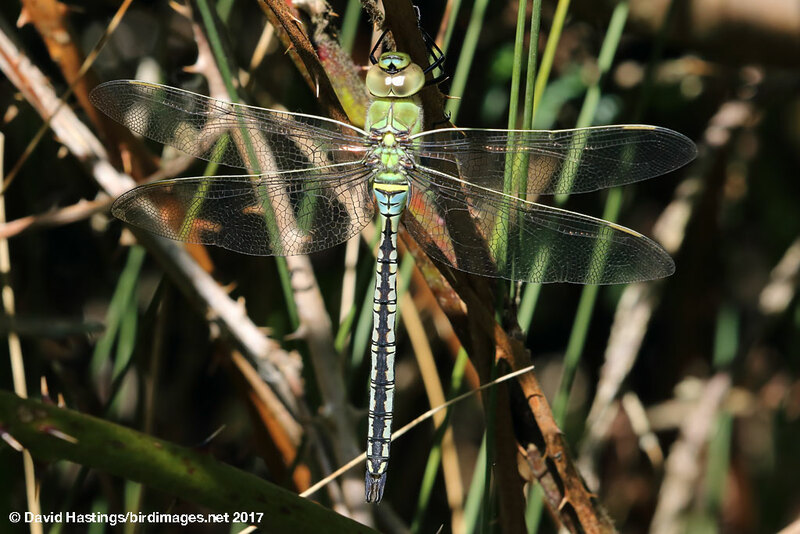 Emperor Dragonfly (Anax imperator). Ovipositing female. Taken at Pinail, France on June 27th 2010. Approx 2x lifesize. Ovipositing female. Taken at Pinail, France on June 27th 2010. This is the largest aeshnid in most of Europe. Males are unmistakable due to their size, unmarked green thorax and blue abdomen with a black mid-dorsal stripe. The female is green with a black dorsal stripe. Tenerals are pale green and have brown rather than black markings on the abdomen. Both sexes have a yellow costa and brown wing spots. It is most commonly found south of a line between the Wash and the Severn estuary. It is also found further north, in south Wales and southern Ireland. This species prefers standing waters, often large and well-vegetated. It also breeds in new ponds and can tolerate brackish water. The female lays eggs alone, usually well offshore, typically into pondweed. The eggs hatch after about three weeks. The larvae usually take two years to mature. The flight period is June to August. Males are highly territorial and vigorously defend their territory against all incomers. They catch and eat prey on the wing, although larger prey items like butterflies are eaten at rest. Common and widespread in southern England.